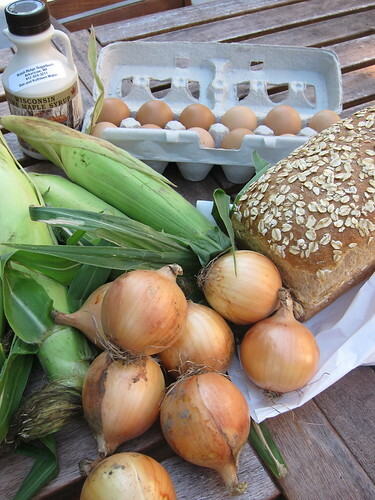 We bought so much at the farmers market last week that this week just picked up a few staples. Yes, sweet corn is a staple this time of year! How amazing does that Lunchbox bread from Sun Street look? I can't wait to have a sandwich on it for lunch today. 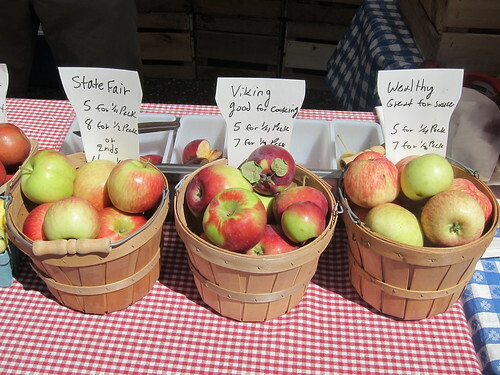 Signs of fall are hitting the market too with the first of the apples. I'm interested to see your potato and leek soup. I've never made one that I was happy with. Also, I'm not quite ready for fall, so if you could just postpone it for another couple of months, that'd be great. Oh yeah, that bread looks amazing. I'd love to have a slice with some apple jam... hmmmmm! I finally got around to getting the addresses to the Twin Cities Farmers Markets down here by Northfield. Hope to go either tomorrow or next week! So Viking apples are good for cooking, eh? I'll have to try something with the ones we have from the co-op. I second the potato leek soup pic request, I haven't had good luck with that either. The bread was the first thing I noticed in the photo! It looks amazing.